Plan a flight at home using SkyDemon's flight planning features, then save time at the airplane by sending the planned route to the SkyView system via Wi-Fi. Flight plans sent from SkyDemon can be edited on a SkyView and flown by the SkyView Autopilot. Updated flight plans can be transferred to SkyView at any time. Pilots also benefit from SkyView’s built-in WAAS GPS, which can drive aircraft position in SkyDemon. This is great for those with Wi-Fi-only iPads and provides an additional high-availability GPS source for GPS-equipped devices. The SkyView - SkyDemon connectivity is enabled by a new Wi-Fi Adapter for SkyView, which is installed in any of SkyView’s USB ports. The Wi-Fi Adapter costs $35 and can be purchased from Dynon Avionics dealers or from Dynon directly. One is required for each SkyView display installed in an aircraft, maintaining system redundancy. Once configured, SkyDemon connects to SkyView through a secure WPA2-protected Wi-Fi link. Support for the Wi-Fi Adapter is already built SkyView 12.0 software and later and SkyDemon's latest app release, which can be found at www.SkyDemon.aero. 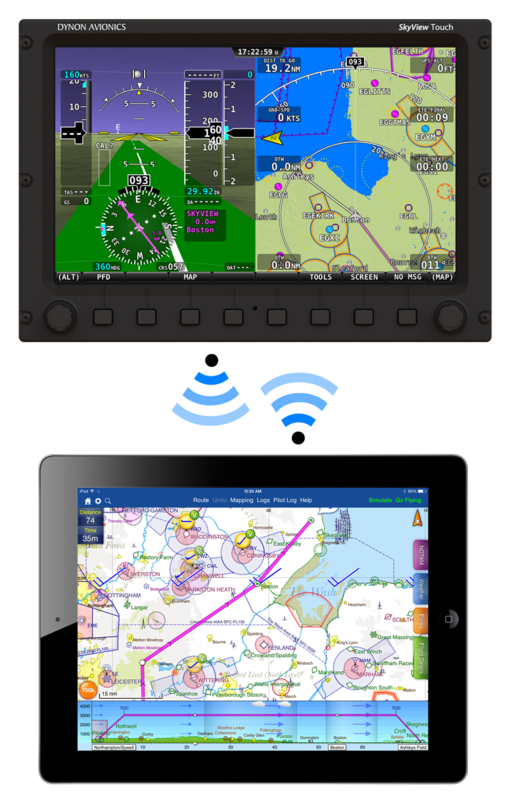 Wireless connectivity between Dynon SkyView and SkyDemon requires SkyView 12.0 (or later) software, a Wi-Fi Adapter for each SkyView display, and the latest SkyDemon app. Instructions for configuring and using these features are in the updated SkyView System Installation Guide and Pilot’s User Guide. The latest version of SkyDemon software with a current subscription. What SkyDemon devices and apps are supported? The Wi-Fi FlightPlan transfer to / from Dynon SkyView is supported on all SkyDemon for iOS and Android.